Described as the ‘jewel in the crown’ of Damac’s Akoya Oxygen development, the retail strip will be unveiled at this week’s Arabian Travel Market (ATM) exhibition in Dubai. “Vista Lux is one of many elements which make Akoya Oxygen stand out from the rest and provides an intrinsic added value to residents,” said Ziad El Chaar, Managing Director, Damac Properties. Located near the Dubailand area of Dubai, the focal point of Vista Lux will be cultural events, performances and art displays, including an open-air designer fashion market, the ‘V’ Restaurant with a menu selected from the freshest organic ingredients sourced at the Akoya Oxygen farmers market, and an outdoor area called ‘The Green’, showcasing cultural performances, poetry readings and mini-theatre productions. A Library and Coffee House will also be housed close to a dedicated area for art installations set on a street which includes mobile, gourmet ‘street food’ providing dishes from around the world. 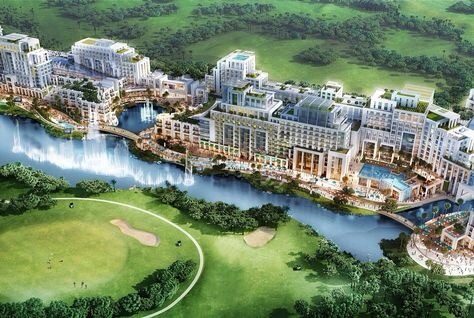 “Vista Lux will house more than 2,000 hotel apartments and residences allowing visitors to the Dubai Rainforest, or those looking to challenge themselves at the Tiger Woods-designed Trump World Golf Club, Dubai to have an all-encompassing, holistic experience during their visit to Akoya Oxygen,” added El Chaar. The rainforest area will be housed in a dome structure and will consist of a tall, dense jungle environment. Visitors will be able to climb into the canopy, fly through the treetops on a zip wire or relax in the Rainforest spa area with hydrothermal treatments and rock pools. Posted on May 5, 2015, in #middleast, #retail. Bookmark the permalink. Leave a comment.